How can a company gauge it’s reputation and impact in the market? Old age business school tells a very simple formula for the same: Ask your customers, and you shall get what you need. It seems that the new age ecommerce companies are slowly but gradually realizing this fact, but there is a warning: The questions can get uncomfortable, and the brutal postmortem of your company’s services can cause some heartburn. 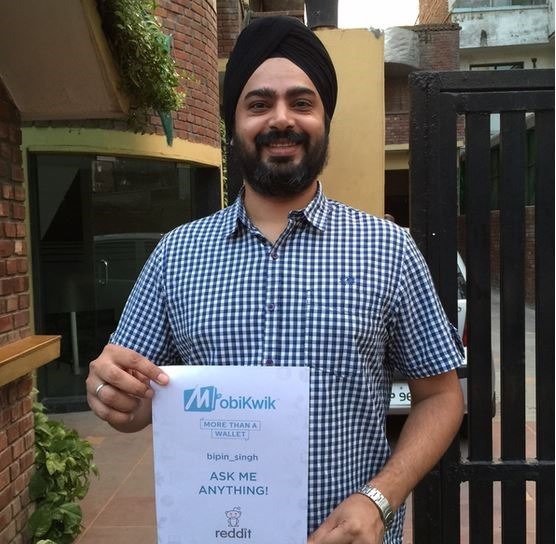 Mobikwik co-founder Bipin Singh experienced some similar sentiments, when he decided to conduct an Ask Me Anything or AMA session on Reddit India recently. Irate customers of this mobile wallet, who have received cold responses from their customer care executives in the past, and have lost all hope of recovering their money, vent their anger and frustration during the AMA session, and Bipin found himself totally unguarded against the onslaught. Mobikwik was founded in 2009 by Bipin Singh and Upasana Taku. In 2013, they raised $5 million in Series A funding, and in April this year, Cisco along with other VCs pumped in $25 million as Series B investment. Although Paytm and Mobikwik were launched in the same year, the former has dwarfed them in every aspect. On one hand Paytm has 25 million customers who perform a million transactions every day, with an annual revenue run rate of Rs 6200 crore; Mobikwik has around 15 million customers with annual revenue of Rs 1500 crore. Clocking 300,000 transactions a day, Mobikwik is certainly struggling at this point of time. And the questions posted by Reddit users during the AMA gives us some hint of the reason behind Mobikwik’s lethargic performance: Customer Satisfaction and Dependability; or rather lack of it. 31 down votes is self-explanatory. Considering the pain and the delay experienced by the user, the reply was certainly lacking in every aspect. 19 downvotes seems justified here. When one Reddit user asked some product specific question, Bipin was open, and he replied it well. And the fact that he is a programmer as well, added to the weight. Bipin scored another brownie when he posted some real personal answers, thereby providing a transparent medium of communication. When a user asked why Mobikwik prefers cards over net banking, Bipin provided a vague reply, which doesn’t merit any logic. Reddit community hates marketing on their platform, and when the founder of a startup asks to download an app, then it can’t be worst than this. The replies from Bipin seemed half hearted, without that fire which we expected from an entrepreneur who is trying to change this world. With few exceptions, all the answers were either vague, without any logic or simply marketing oriented. It could have been turned into a session where the negative vibes against the services were countered with positivity and a new determination. But all that this AMA achieved was desperate attempt to maintain the status-quo. You can check out our report of AMA sessions of Zomato founder Deepinder Goyal and Housing.com’s co-founder Rahul Yadav. Wish to see mobile wallets (specially Mobikwik) become so popular, so, we have no need to carry cash.. The first screenshot is true. Mobikwik is worst and unreliable when it comes to offers. I myself fooled many times (even in that strike gold offer :d). Their transactions also fail many times for Postpaid when requested money to refund, the answer given by them is “Please use the money in wallet for prepaid numbers”. Mobikwik is ugly in every aspect. And there is nothing called customer service for mobikwik.